Let’s start off by getting over the provocative title, shall we? We hear the four-letter-word (and worse) all the time. Every day, in fact. Like the title of a book, a movie title should grab us, take hold of our attention and get us either curious or send us on our way. Well, “Shitcago” is a film title that obviously caught my curiosity when I heard about it last year – how could it not? 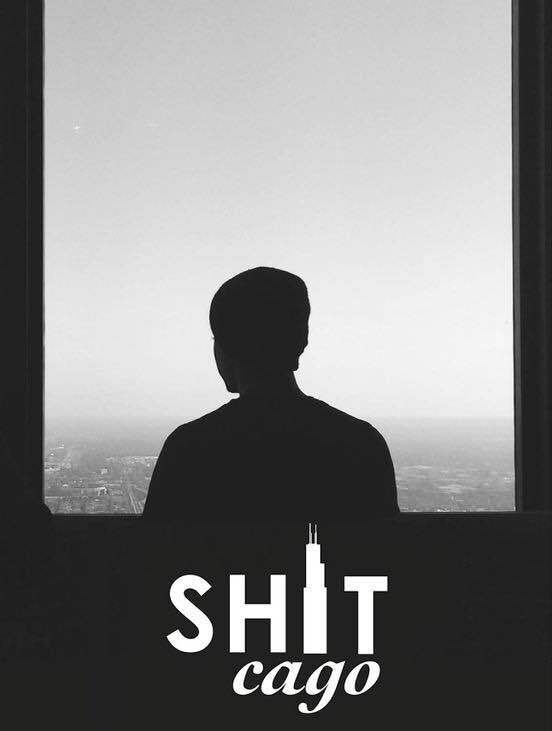 I live in Chicago and I certainly have at times felt like the Windy City has epitomized the sentiments of that title, but I found myself curious as to what local writer/director Nick Alonzo had going on in his directorial debut. 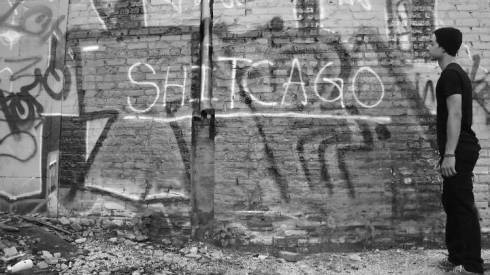 Is there substance in his film beyond the provocative title and does it present something Chicagoans or those in other cities can connect with? The answer is “yes”, to both questions. 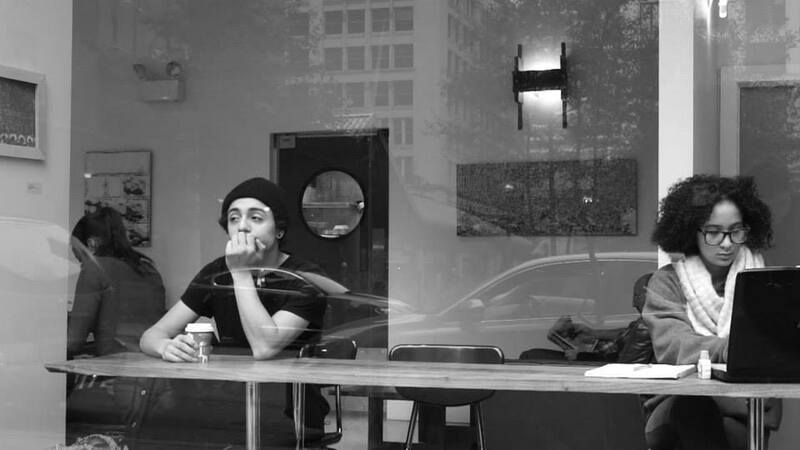 The black-and-white film follows the life of a twentysomething loner (Jeremiah Aviles), as he leaves his apartment and wanders around Chicago. We watch as he travels by bicycle, public transit trains and buses and on foot, through various neighborhoods and into the heart of downtown. He encounters the usual suspects familiar to Chicagoans (or any large city, for that matter) and anyone who rides public transit in an urban area – the space invaders, such as loud cell phone talkers and the persistent guy who wants to bum a cigarette off you, those strangers who stop you on the sidewalk such as foreign tourists and passionate activists and the people you’re desperate to get away from, like the obtrusive drunks on the street or the obnoxious performers in the subway that consider you their sole audience. As we travel with this young man, it becomes obvious he is experiencing what so many of us experience, although he may feel like he’s the only one going through such interactions at the time – which is often how we go through life. Told in a very minimalist style and void of a narrative plot, many will wonder what it is they’re watching or who it is they’re following. I felt that initially. I wanted to know more about the main character, who comes across as a very introverted and passive individual, showing very little emotion, yet getting annoyed by some of the same behavior many of us get annoyed by. But I soon resolved that this wasn’t necessarily a film that was going to tell this guy’s story, but tell a story about just another guy like you or me who lives in the titular city. “Shitcago” reminded me how everyone has a story. It’s something I’ve often thought of while observing the people I see everyday – that mother pushing a crying kid in a stroller, that sad old guy staring off into the distance on the park bench, that rude and obnoxious guy cursing out his girlfriend in public – they all have stories and many of them probably aren’t that much different from you or me. Once we understand and acknowledge that, it provides a better understanding for humanity and ourselves. That’s what this movie reminded me of. Sure, there are technical elements of Alonzo’s movie that I would’ve done differently, but I stopped myself and thought “here’s a guy who’s doing it”. It’s Alonzo’s first film and it’s very personal, drawing upon his own experiences in the city, but he’s out there doing it. He’s got a lot to learn and my bet is he’s learned quite a bit making this film and he’ll learn a lot more in his future filmmaking endeavors. Alonzo’s film essentially feels like a tour through a city that wants every part of you, yet wants nothing to do with you. He sees the beauty and the harshness of the city and responds to it through this aimless avatar who’s cycling through a mundane life. Someone who’s surviving, taking each day as it comes (as we often do), while putting up with “Shitcago”. I’m looking forward to following Alonzo and seeing where he goes from here. His film reminds me to always be open to new voices and perspectives in film, because in doing so, you’ll likely find something to appreciate a little more in your own life. for more on the movie….